In 2008, the George Mason University Green Machine pep band led by Michael Nickens aka Doc Nix faced an interesting dilemma. As Nickens and the band learned that they would be dancing in the NCAA Men's Basketball tournament they also learned that the inclusive environment they had created by allowing amplified instruments like electric violins and bass guitar would not be permitted due to NCAA tournament rules. As it is, electric amplification of instruments has been forbidden during tournament play and the size of bands are limited to just 29 players. Most bands’ rosters are significantly larger, forcing band directors to cut their groups down significantly. "For the 2011 tournament I went ahead and brought a string section anyway because I wanted those individuals there because of their passion and leadership," said Nickens. "They still contributed, and it was worth having them there, but the experience was incomplete because of the lack of amplification." The George Mason Green Machine numbers well over 150 members. At Virginia Commonwealth University (VCU) over 110 students are part of the band. 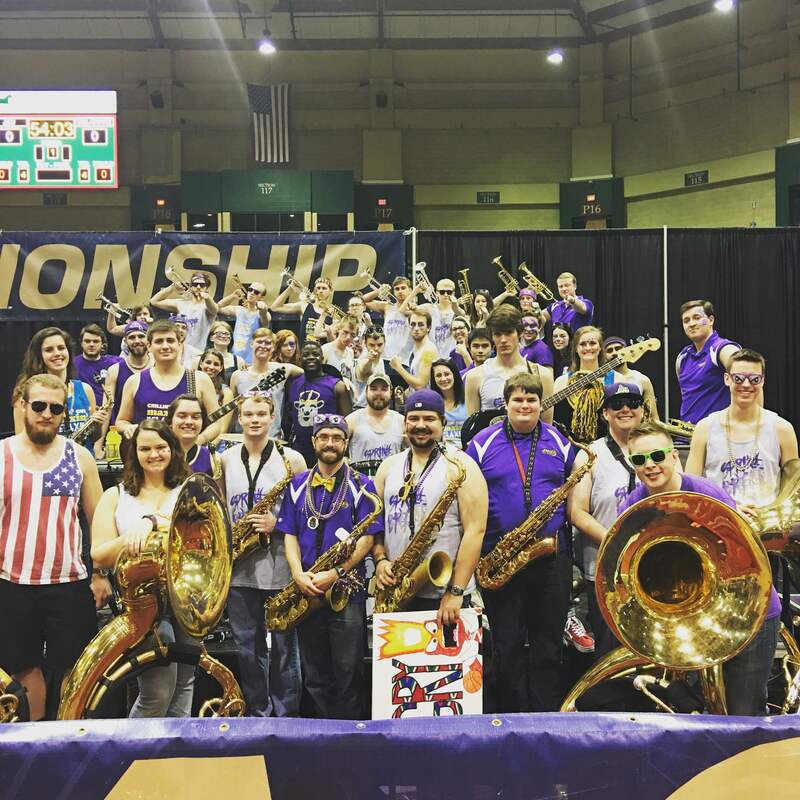 At James Madison University (JMU) nearly 70 students volunteered to perform with the pep band for the tournament, 41 were told no. "My electronic instruments (guitar/bass) know to not even sign up," said Chad Reep, Director of the JMU Pep Band. "Some small schools can't field a large contingent of low brass. One player on an electric bass can compensate for that missing sound." Bands across the country are feeling the crunch, but why? Why won't the NCAA allow electronic instruments or maybe increase the size of the band to a more workable number like 40 members instead of 29? "If a band can provide their own equipment, set it up quickly, and they don't take up too much room, what's the problem? If it's too loud, we turn it down," said Reep. If the answer is money or “the band would take up too many seats”, then the NCAA has a serious problem on its hands. According to the NCAA's own reports, the tournament accounted for more than 80% of the NCAA's $871.6 million in revenue in 2011-12. That's the last year they have posted any financial data. Where does that money come from? In 2010, CBS and Turner agreed with the NCAA to pay $10.8 Billion to host the tournament from 2011 to 2024. That's $771 million annually just in TV money. Yes you read that correctly, $10.8 Billion. So where does that money go? To the pep band? Well, sort of. The NCAA does cover the cost to move the small pep band to the game site and puts them up at hotels while they are in town. The cost per student for a team that only plays one game is under $650. They do that for the teams, coaches and spirit squad as well. In fact, most of what the NCAA makes goes back to the athletic conferences and schools themselves. According to the NCAA website: "All but 4 percent of NCAA revenue is either returned directly to member conferences and institutions or used to support championships and programs that benefit student-athletes.” That money is minus what they need to spend on events like the NCAA Tournament which includes transporting and housing the bands. Surely that means that the schools would want to advocate for more pep band students to travel to the tournament and properly represent the institution with a balanced band, right? One would hope so, but they have some pockets to fill first. Unfortunately, the majority of the money does go into someone's wallet, the coaches. Bonuses for college basketball coaches are as crazy as you'd think. Tony Bennett, the Head Coach of the University of Virginia Men's basketball team got a $50,000 bonus just for making the NCAA Tournament. He will get another $100K for making the Sweet Sixteen, then $250,000 for a Regional Final Appearance, another $250,000 for a Final Four Appearance. Then the big bonus is a $400,000 check if the team makes it to the Finals. That's $1,050,000 in bonuses for this year's tournament. PLUS another $75,000 if they finish ranked in the top 10 in the final AP or coaches' poll. By the way UVA is a #1 seed in this year's tournament. What do the band directors get? You guessed it, nothing. No bonus structures exist for band directors during basketball season. While money clearly shouldn't be a factor in the NCAA's decision to limit the size of the band based on their $10.8 Billion pay day, it especially doesn't make sense as to why they would prohibit the use of an amplification system. Are they worried about players tripping on cords if they run behind the hoop? Well, first of all, a player would have to get through the three rows of photographers who sit on the baseline and all the TV camera cords that are draped along the outside of the court as well. Then they'd have to hop into the pep band's bull pen that is actually barricaded. If then they trip on a wire inside the bull pen then so be it, but it's nearly impossible for them to get that far. Not to mention that most guitar and bass drum players are positioned towards the back of the band. So it's probably safe to say that the dangers that lurk from electric cords for two instruments should be a non-factor. What about the noise that is generated from electronic instruments? Is a bass guitar during a time out or some kind of stoppage in play really going to effect the players and coaches? Remember, the band can ONLY play during a timeout or intermission. Considering that these instruments are used all year long at VCU and George Mason and no opposing teams ever complain, then this argument also has no weight. The NCAA themselves called George Mason and VCU the best pep bands in college basketball this year labeling them as “responsible for amping up the crowd”. Wouldn’t they want the best pep bands to be able to perform to their best abilities? How is it that almost all conference tournaments played just days before the NCAA Tournament allow the use of electronic instruments, but the big dance does not? "We can, and have, adapted our performances to fit these situations, but we would be better able to share our unique ensemble with college basketball’s most engaged and passionate spectators if we could bring our true product," said Nickens. 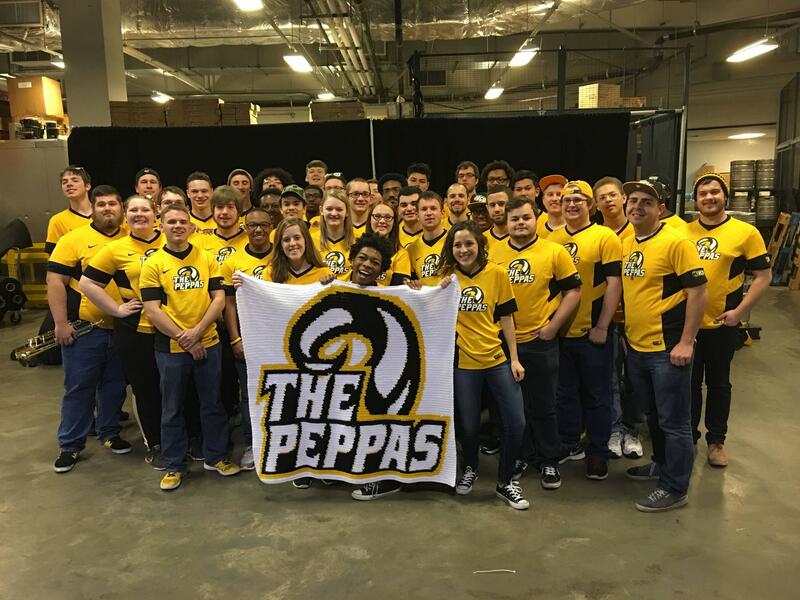 The VCU Peppas Athletic Band once again will entertain fans at the NCAA tournament this year without their usual assortment of electronic instruments, singers, rappers and more. "What we try to do is put on a concert. A show. We are free entertainment for the fans. You know as a sport that has had its ups and downs no matter what, the league needs to diversify or it will die," said VCU Director Ryan Kopacsi. "You have to appeal to something more than the game." Limiting these great pep bands to just 29 members and no electronics is cheating not only the fans in attendance during the tournament, but also the millions of fans that are watching across the country. That is why Nickens, Reep and Kopacsi have united together to make their voices heard. Their request to the NCAA is simple, adopt a new policy increasing the band size to 40 students and allow the use of electronic instruments with amplification during the tournament. "In the end, the biggest thing that kills us is the fact that many deserving students have to be left behind because of some old rule. Moving that up to 40 will allow the infusion of more students and will add a whole new element to what we do," explained Reep. "Two of my most dedicated seniors are sitting home this week because they play guitar and bass. It's a real shame." 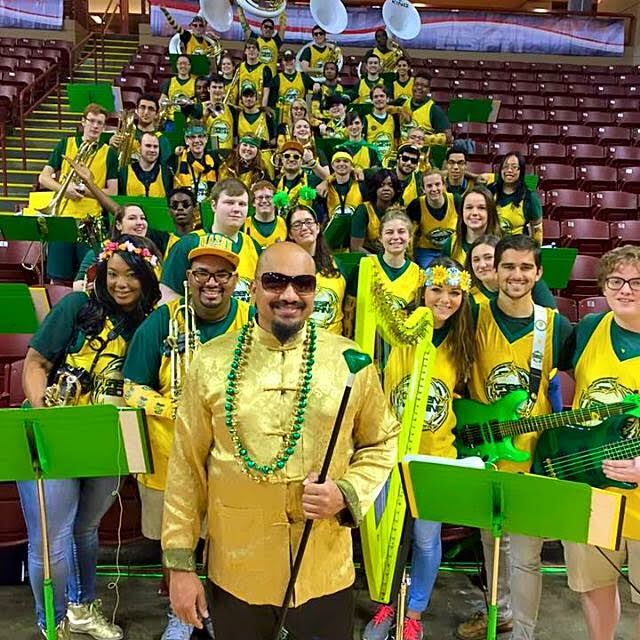 Help us petition the NCAA to change their restrictions on college pep bands during the basketball tournament by signing and sharing this petition with the rest of the band world. We all need to unite to make this positive change for college pep bands! On social media use the hashtag #ExpandTheBand and send the NCAA tweets explaining why they should consider this!